Ph.D. Chemistry (Materials chemistry), 2007, National Chemical Laboratory-Pune. Project Research Fellow: Institute of Advance Study in Science and Technology (IASST), Guwahati, India. (2001 to 2002). 1. Best speaker (oral) in RSC workshop on Chemistry for tomorrow�s world, December 2-3, 2015 at New Delhi by Royal Society of Chemistry, London. 2. DAE-BRNS Young Scientist Award-2011 by Department of Atomic Energy, Board of Research in Nuclear Sciences, Govt. of INDIA. 3. Invited speaker as Young Scientist in National Seminar on Recent advances in synthesis and catalysis (RASC-11) during 10-12th Feb 2011, Dibrugarh University, Dibrugarh, Assam. 4. TMS Foundation 2008 SHRI RAM ARORA AWARD, The Minerals, Metals & Materials Society (TMS), Warrendale, PA 15086-7514, USA. 5. Best Poster Award in National Science day poster presentation competition, by NCL Research Foundation 2006, National Chemical Laboratory, Pune, India. 6. Award of Junior/Senior Research Fellowship (JRF/SRF-NET) for 2002-2004-2007 yrs. by UGC-CSIR, Govt. of India, New Delhi. 7. Award of National Level merit Scholarship for 1993-1995 yrs. by AICTE, Govt. of India. 3. Honorary Member, American Chemical Society (2015-2018). National Seminar on Nanochemistry, 11-12 November, 2014. Dept. of Chemistry, sam higginbottom institute of agriculture technology and sciences, Allahabad, India. 1. Invited talk �Development of transition metal based alloy and chalcogenide nanoparticles and their emerging applications� at March Meeting, 16-17 March, 2018. School of Physical Sciences, Jawaharlal Nehru University, New Delhi-110067, India. 2. Invited talk �Ag1−xNix alloy nanoparticles and CuCo2S4 nanosheets and their useful catalytic Applications� at International Conference on Nanobiotechnology, February 5-6, 2018, Centre for Interdisciplinary Research in Basic Sciences, Jamia Millia Islamia, Jamia Nagar, New Delhi 110025. 3. Plenary talk �Metal alloy and chalcogenide nanoparticles for few useful catalytic applications�, at� International Conference on Nano- and Functional Materials: Interface between Science and Engineering (NFM-2017), 16-18 November 2017, BITS Pilani, Pilani Campus, Rajasthan. 4. Invited talk �Nanoscience and Nanotechnology� Department of Chemistry, Miranda House, DU, November 6, 2018. 5. Memorial lecture: Dr. C.K. Khurana Memorial lecture for Rasgandhayan, Gargi College, DU, September 6 2017. 7. Invited talk �Exploration of unique two dimensional CdSe/CdS core@shell hexagonal nanoheteroplateles and CdSe/CdS-Au hybrid nanocrystals� at The International Conference of Young Researchers on Advanced Materials (IUMRS-ICYRAM 2016) 11-15, December 2016, Bangalore, INDIA. (14-12-2016). 10. Invited talk (emphasis on academics and research for undergraduate students) �NanoScience: Big Word of small Things� Kirori Mal College (KMC), University of Delhi, January 23, 2016. 11. Invited talk �Multifunctional applications of few nanostructured inorganic materials� International Conference on Advanced materials-- Energy, Environment and Health (ICAM- 2016)March 04-07, 2016, Department of Chemistry, Indian Institute of Technology-Roorkee (IIT-Roorkee). 13. Invited talk �Synthesis, characterization of multifunctional applications of inorganic nanomaterials�� Leibniz Universit�t Hannover, Hannover, Germany. December 10, 2015. 14. Plenary Talk �Multifunctional Inorganic Nanocrystals: Synthesis, characterization and applications� Seminar on nanochemistry, Sam Higginbottom Institute of Agriculture, technology and sciences, Allahabad, UP. 11-12 Nov, 2014. 15. Invited talk �Synthesis, characterization and applications of multifunctional inorganic nanoparticles� NanoSci-2014, IASST, Guwahati, Assam. 20-21 December 2014. 16. 1st International Conference on Emerging Trends of Nanotechnology in Drug Discovery, 26-27 May 2014, Sri Venkateswara College, University of Delhi and Department of Biochemistry, University of Delhi South Campus. 17. Resource person: Nanomaterials by solution based chemical synthesis procedures, 20th May 2014, Refresher course in Basic Sciences (Interdisciplinary), UGC-Academic Staff College, Jamia Millia Islamia, New Delhi. 19. 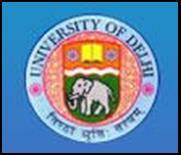 Indo-German workshop on "New Perspectives for Nano-carriers in Biomedical Applications" 14th January 2013, Department of Chemistry, University of Delhi. 20. Invited expert talk: Vigyan Prasar EduSAT network, DST, Govt. of India on �Nano Technology an Introduction� on 24th January 2013 during 10.30 AM to 1.00 PM at C-24 Qutub Institutional Area New Delhi-110016, for the students of class XI and XII. 21. Career and Higher Education, 4th June 2012, Seminar: Career Prospect in Higher Education, Career guidance cell, Pub-Kamrup College, Baihata Chariali, Kamrup, Assam. 22. Invited talk NanoScience and its applications in Biotechnology, 5th May 2012, Refresher course in Basic Sciences (Interdisciplinary), UGC-Academic Staff College, Jamia Millia Islamia, New Delhi. 23. Invited talk Nanoscience and Nanotoxicology, 22nd February 2012, Solid State Physics Laboratory (SSPL)-DRDO, Delhi. 24. Invited talk NanoScience and its applications in Biotechnology, 16th June & 19th June 2011, Refresher course in Basic Sciences (Interdisciplinary), UGC-Academic Staff College, Jamia Millia Islamia, New Delhi. 25. Invited talk NanoScience: Big Word of small Things, 10th September 2010, Department of Chemistry, University of Delhi, Delhi. Reviewer of ACS, RSC, Elsevier, etc. journals.